Reaching a weight loss goal while using positive reinforcement training. Is it possible? Yes it is. Here is Sophie’s story. We’ve all seen them, the dogs whose bellies are virtually dragging on the ground as they walk. Running for these dogs is impossible and it’s hard to tell if they are standing or lying down because their height doesn’t change much between the two. Even when at rest they never seem to stop panting, and watching them try to get up or walk is almost as painful for us as it is for them. As a positive reinforcement trainer it has always been a concern of mine that dogs maintain a healthy weight throughout their training. Even with intense training there is no reason for a dog to gain weight. In fact it’s possible for an obese dog to lose weight when using food rewards for training. Our featured K9 client, Sophie, is a perfect example of this. 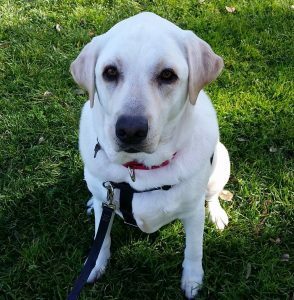 Sophie, a beautiful and “plump” yellow lab was adopted by one of our clients. It was a case of the previous owner allowing her to gain more than a few pounds of excess weight. Her new adoptive mom immediately went to work, bringing her to a healthy weight and training her in some basic skills like sit, down and loose leash walking. Through planning, follow-through, and consistency the transformation that ensued is nothing short of amazing. Pawsitive Paws was so moved by this story that we thought others may find inspiration in the transformation of this beautiful dog. We asked, and the owner was gracious enough to answer, a few questions that may give some insight into how this transformation took place. We hope you find this story as uplifting as we do. Tell us a little about your previous dog experience (i.e. how many and what types of dogs have you owned in the past? Did any of them have weight issues? I have owned three other dogs. Coincidentally, my other rescue many years ago was also a yellow lab who was overweight when I got him. I controlled the amount of food he got and supplemented his food with raw carrots and unsalted green beans to add some bulk. He lost 20 lbs. Why did you adopt Sophie? I adopted Sophie because I was looking for a dog for pet therapy work. I have been volunteering with Paws’itive Teams for 2 years but without a dog. Once I retired, I had time to devote to training. Sophie was a great candidate. She was a yellow lab, which is a breed I love. She was 3 years old, an owner relinquish, and had a very sweet, social personality. What was Sophie like when you first adopted her? 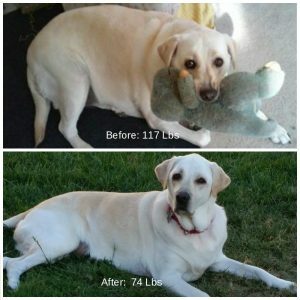 When Sophie came to Lab Rescue August 1, 2015, she weighed 117 lbs. When I brought Sophie home November 1, 2015, she was 3.5 yrs. old, weighed 102 lbs., apparently zero training, but a loving, outgoing personality. She did not know how to walk on a leash, she vocalized while riding in a car, and bolted through every doorway she saw: inside, outside, car doors. She would barge past people and dogs. She seemed to have no sense of herself in space or respect for the space of others. My sense was she had always been a big gentle giant and was allowed to do as she liked. She would not sleep through the night. Since she snored like a hibernating bear, I frequently didn’t sleep through the night either. The upside? She loved everyone and every animal she met. What was your vet’s reaction to her weight? What was your weight loss goal and plan for her? Did you free feed her? At her first visit to the vet, I let him know she had already lost 15 lbs but I knew she needed to lose more. He agreed, and we determined that 75 lbs. would be our target weight. He did caution me to do it slowly. That would produce the best results. Sophie came to me with a specialized “diet dog food” which had a lot of fiber in it. I got one additional bag to gradually switch her over to what I was feeding my other dog, a high quality salmon-based food with no wheat or corn. She was allotted 2 cups of food per day: 1 cup in the morning and 1 cup in the evening. Once I began training, I subtracted from her daily allotment to use for training. I initially just used kibble for training. Impulse control was a big issue for her. So, at one point Sophie got no food from a bowl. She earned all of her food through training throughout the day. Once I had her full attention, I gradually moved to bowl feeding morning and evening. Reserving a portion for training throughout the day. Later, I began to introduce more high value treats like freeze dried liver or Stella and Chewy’s dinner patties. These were broken into very tiny pieces. For a while I read all food and treat labels to make myself aware of the calories and fat content. What I figured out was as long as I followed the 2 cups a day rule, she continued to slowly lose weight. I cannot emphasize enough how small her rewards were. Just tiny bits. Exercise was another important component of her weight loss plan. Initially, she walked slowly and favored her front right shoulder when walking downhill. She frequently had to be encouraged to walk uphill. I began with 3 short walks a day. Sometimes it was just around the block. I just made sure she moved every day. We slowly began to add distance until she could do 3, half mile walks a day. Eventually, she worked up to 2, one mile walks a day. Now, we walk 2 miles every morning. We walk an additional mile to mile and a half in the evening. What is her current weight? Sophie currently weighs 74 lbs. How did Sophie deal with her weight loss plan? Sophie did not seem bothered or anxious about limited portions. She did not pester me for food or watch me while I ate. She did not become possessive or resource guard her food. What benefits have you and Sophie experienced due to her weight loss? She walks 3 miles a day and keeps up a brisk pace. She no longer favors her shoulder. She sleeps through the night. Her snoring has almost disappeared. Occasional soft snoring has replaced window rattling. When she was over 100 lbs, she would gladly sleep most of the day. Now that she has lost weight, she enjoys activity. She lets me know if I have forgotten a walk. You have taken a few classes with Pawsitive Paws and we use positive reinforcement training which can include food rewards. Some are worried their dogs will gain weight while training. How did you train Sophie and still keep her on her weight loss plan? It was easy to keep her on her diet goals while also doing extensive training. I just had to remember 2 cups of food per day was her limit. Part of that was in training treats, part was her kibble. When she was actively dieting, she would lose 5 lbs a month, which was a good pace. Now that she is at her target weight, she gets 1 cup of food twice a day. The training treats are now additional to her 2 cups a day. We walk every, single day. I also take her to the vet every 6-8 weeks to weigh her and make sure we are still at our target weight. Is there anything you would like to add? A couple of comments about feeding. Some people have asked about free feeding their dog. I personally have a 15 minute rule. I put out the food. If there is food left after 15 minutes, it is too much food. Actually, 5 minutes is enough time for of my dogs to eat, get a drink of water and then check out each other’s bowls. Bowls are then picked up and put away. I do not run a restaurant. Also, 1 cup means 1 cup. A rounded cup can mean 25 additional calories or more per meal. Considering two meals per day, in the course of a month, that is 1,500 additional calories. If you add a few treats here and there, you can easily increase that to 2,000 -2,500 calories a month. On the other hand, if you just make a small dip in that cup, you can easily remove 25 calories per meal. It is important to remember that every dog is different. I also have a mixed herding breed dog. She weighs 36 lbs. She gets exactly the same amount of food as Sophie who weighs 74 lbs. They are just different dogs.